FOR THE LADIES: CHANNING TATUM IS SEXIEST MAN ALIVE! 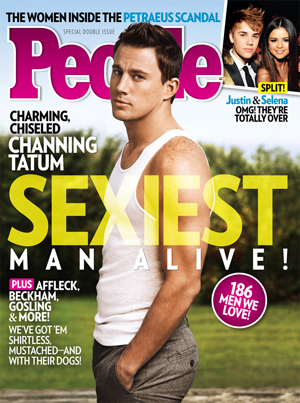 Channing Tatum on the cover of People’s Sexiest Man Alive 2012 issue. Channing Tatum’s star power keeps rising! Just in the past year he’s hosted Saturday Night Live and released a few movies: Haywire, The Vow, 21 Jump Street, and Magic Mike. And now he can add something else to his awesome year: 2012’s Sexiest Man Alive! Click here for the article. People.com also rounded up some nice photo galleries of Tatum, plus other cuties such as Bradley Cooper, Matt Bomer, Paul Rudd, etc. Check it out here!